Made these for hubby and he loved them. 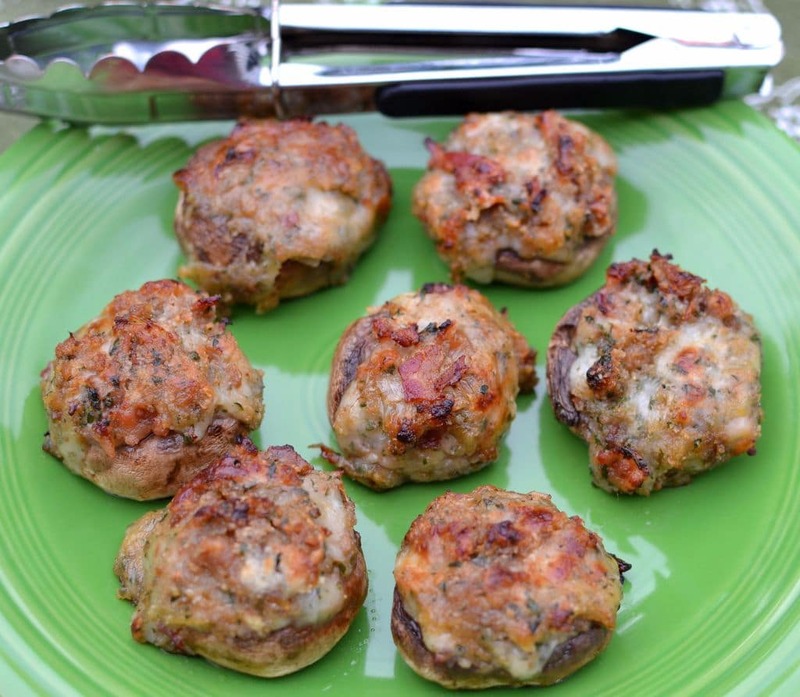 I am sure if you love mushrooms you will too! 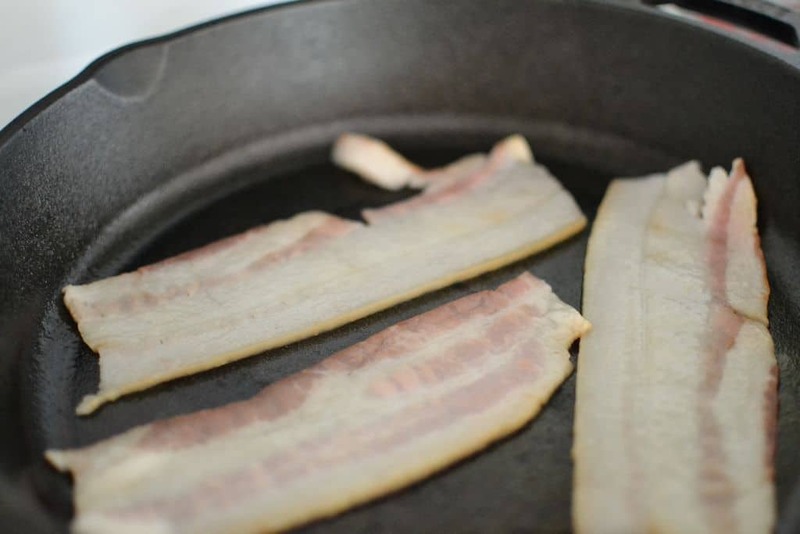 Grab that old cast iron skillet and fry you up just a few slices of bacon. You can do extra if you know you are going to be nibbling on it!! It is so hard to resist! While it is cooking wash your mushrooms and remove the stems. 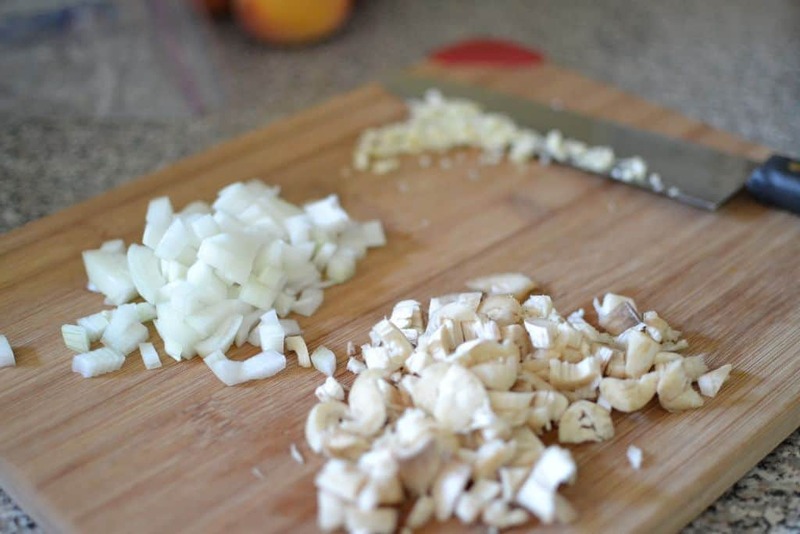 Chop those puppies up along with 1/2 of a medium sized onion and 2 cloves of garlic. 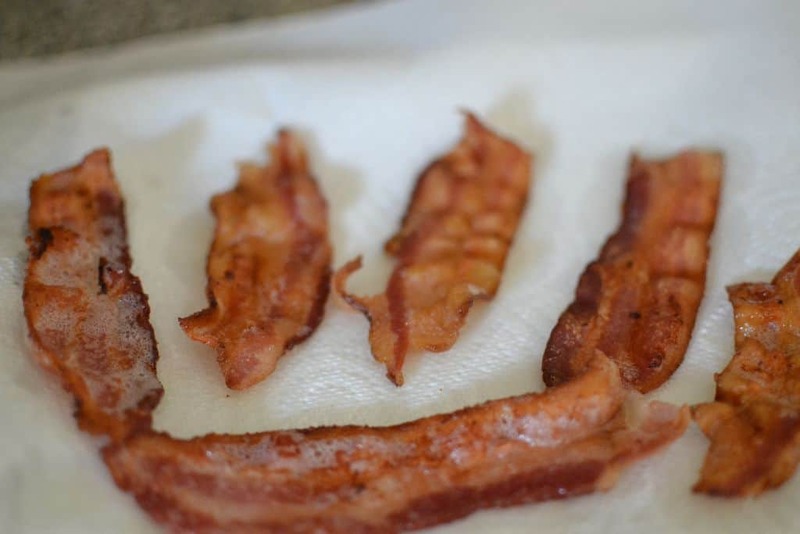 Once that bacon is crisp move it off to a paper towel and let it cool. Once cool, dice that bacon up pretty fine if you don’t mind! 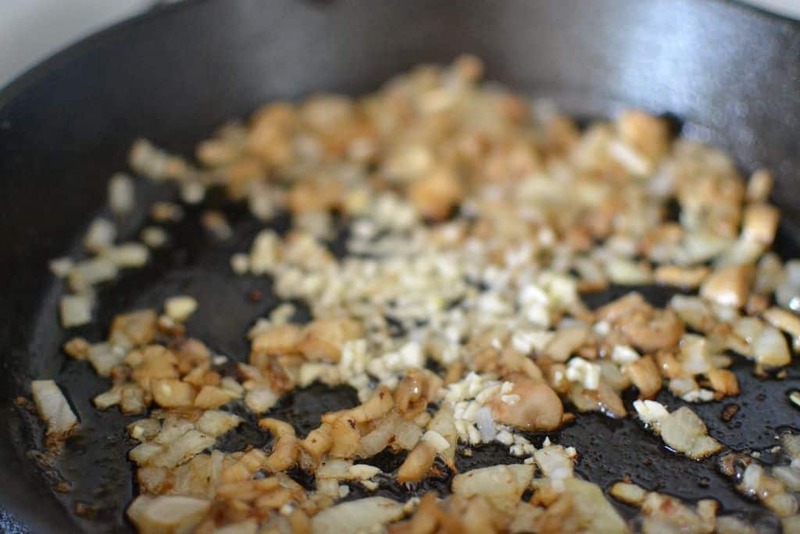 Remove all but a tablespoon of bacon grease from the pan. You can discard it. Now turn your burner on medium and throw in that onion. 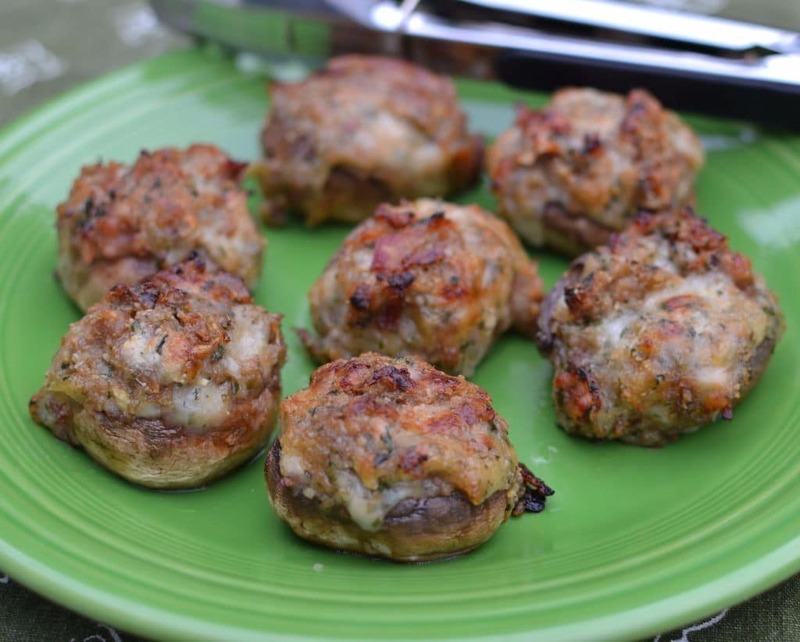 Cook for about a minutes and throw in your mushrooms. Now leave it alone for a couple of minutes. I have learned over the years that good cooking sometimes just requires you to leave something alone for a bit. After a couple of minutes stir it so the other side cooks. Go fold a couple of quick things in the dryer because you want those mushrooms to get a little golden along with those onions! Now when it is almost complete add the garlic but stick around for that because garlic cooks fast. Turn down the burner for that garlic! Cook just about a minute or two. Now add the mirin and the chicken broth. It should start smelling real good right now. Opps turn that oven on 400 degree because you are going to need it. Let this liquid cook down to about half. It will take about 7 – 10 minutes but keep an eye on it while you are finishing that darn laundry. Landry is a never ending task! Remove from the heat and allow to cool a couple of minutes. 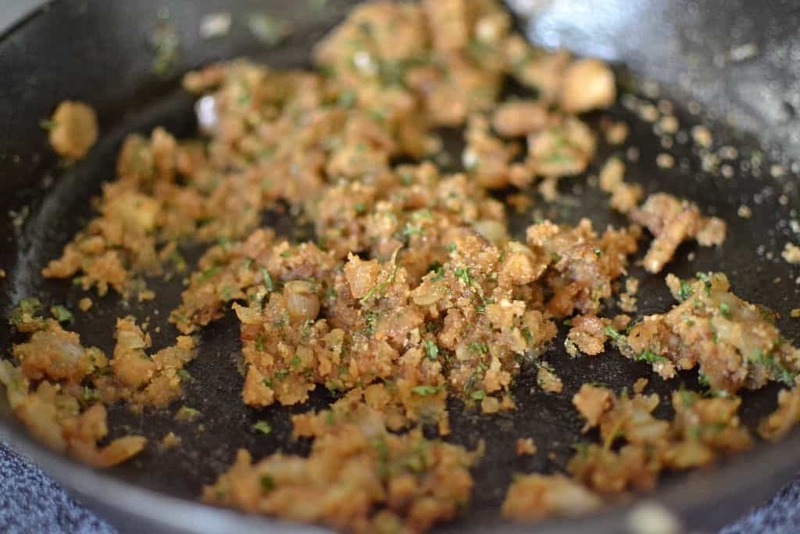 Add the breadcrumbs and the parsley and give it a whirl. Now if it seems a little dry add just a touch of chicken broth at a time until you get a consistency that could be rolled into a ball! Sounds kind of funny doesn’t it? We are not making cookies! Add the bacon and give it another whirl. Add the shredded white cheddar and Parmesan and give it another shake down! Guess who forgot to take a picture of the cheese being added? Place those clean mushrooms on a nonstick baking sheet or if your baking sheet is old like mine spray it with a little olive oil. Now spray the mushrooms with a little olive oil. 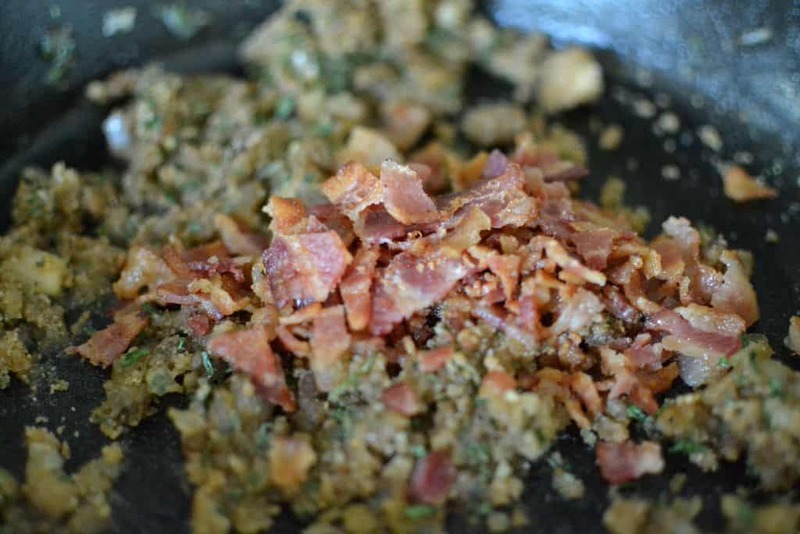 Now take the breadcrumb/bacon mixture and with your hands form as good of a ball shape as you can. It is not going to form like cookie dough but it will help prevent all your goodies from falling all over your cookie sheet. As you can see from the photo some goodies fell out!! Now put those shrooms in the oven for twenty minutes. 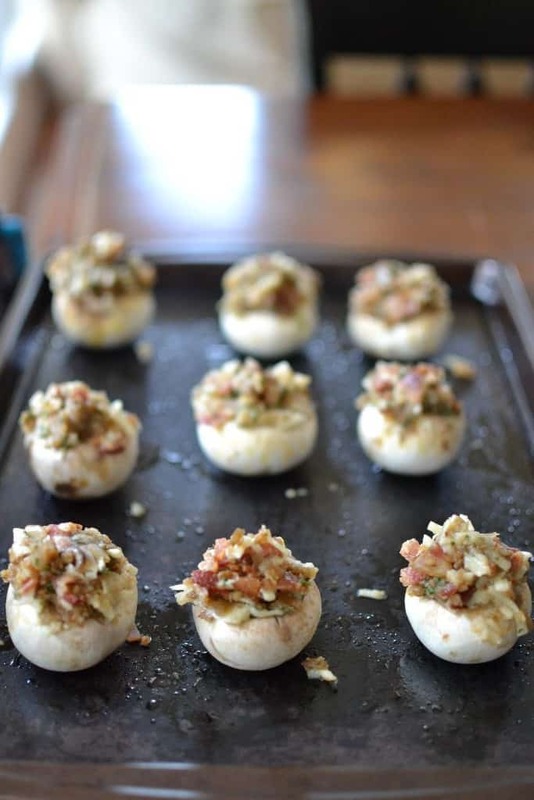 These are so darn delicious you will find yourself making them again real soon. Bon Appetit! Why doesn’t spell check know this phrase and be able to put that fancy thing over the e! Fry up three slice of bacon and finely chop. 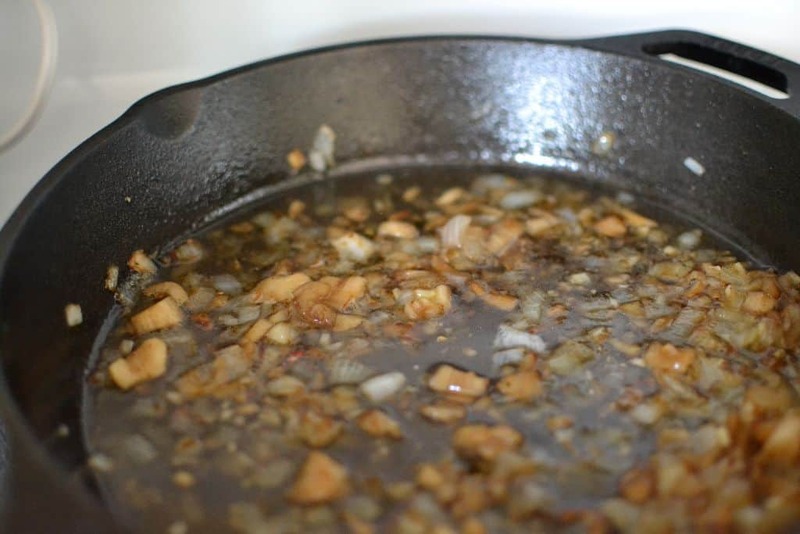 Reserve 1 tablespoon of bacon grease in the skillet. Add the onion to the skillet and cook 1-2 minutes. Add the chopped mushroom stems and cook for an additional 5-7 minutes stirring once or twice. Lower the heat, add the garlic and cook an additional minute. Add the mirin and chicken broth. Cook for an additional 7-10 minutes or until liquid is cooked down by 1/2. Remove from the heat and allow to cool for a few minutes. Add the breadcrumbs, parlsey, cheddar and Parmesan. 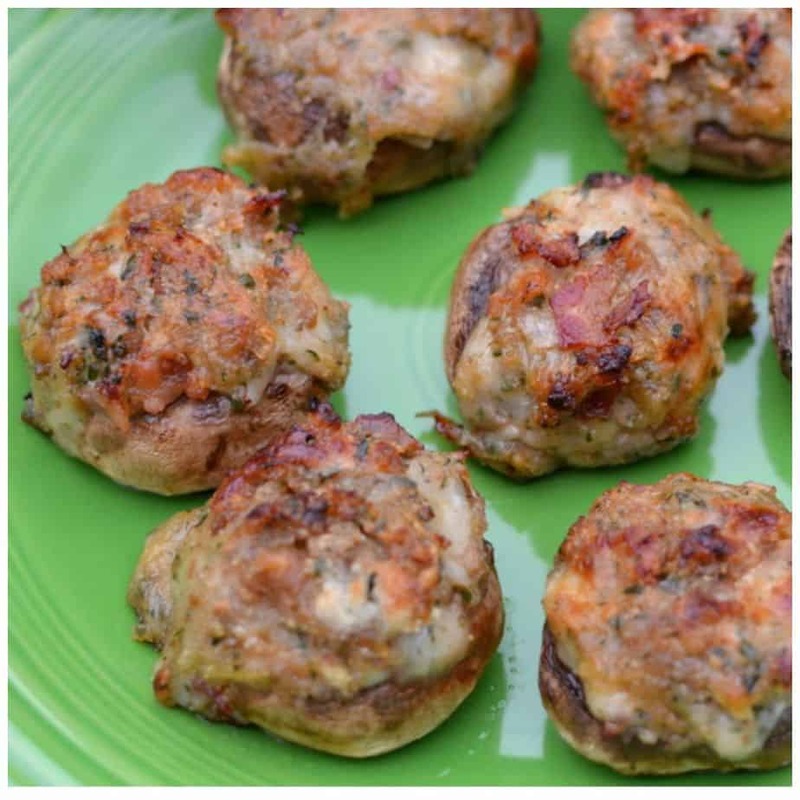 Arrange the mushrooms on a baking and spray lightly with olive oil. Roll the breadcrumbs mixture into loose balls and place onto the mushroom caps pressing down gently. 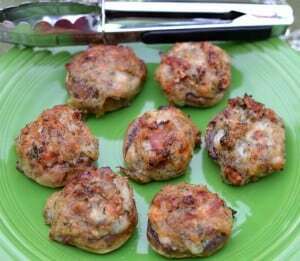 I made these yesterday – they were OUTSTANDING! Better than any restaurant I’ve ever had! Thanks so much for this excellent recipe! What is Mirin and do you need it? Mirin is sweetened sake. You can substitute 1 part sugar to 4 parts sherry. I realize that most people do not have sherry so if you don’t have it or don’t want to purchase it just omit it. I was looking for your recipe for crab stuffed mushrooms”. They looked sooo good.